Please, whatever you do, don’t tell my wife, but I may have discovered the beauty of gardening. 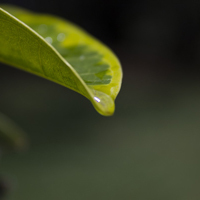 OK, not gardening, exactly – pulling up weeds and digging holes is deffo not included in that proclamation – but the simple joys of watering, for sure. The thing is, I used to come in after a hard day in the gallery and have a beer and watch TV (whilst surfing the web, of course!). But since moving to Porters, these long summer evenings (and having sympathy for my wife’s abhorrence to horseflies) have drawn me out into the polytunnel ‘of an evening’ to water… and I’ve become quite besotted. The still of the evening without a TV, computer or distraction to hand and the sound of a brook across the road bubbling in time to the garden hose, with my best dog by my side has become a new addiction. Is this the start of my love affair with a hoe… hell no! But those quiet moments alone with my thoughts after a long day at the gallery has become a delightful exhalation from the motorway in my head and it’s really quite taken my breath away… or should I say filled my lungs. I suspect once the sun shies away into autumn and the evenings become shorter, that love affair may wane somewhat, but maybe… just maybe it will inspire me to find another quiet way to switch off. 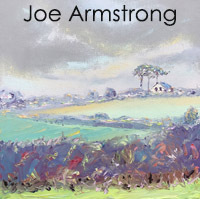 I haven’t written for an age (well, if you exclude here) and I have a true desire to write that farce I so long to pen, so now we have this bountiful home, I’m hoping I will find a way to tear myself from the ease of the TV or web and really use my evenings for something more wholesome… watch this space! As for now, though, how about three upcoming exhibitions to get you started? 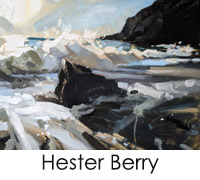 Hilary Stock and Hester Berry‘s exhibitions were hugely popular and I suspect Stephen Higton‘s this coming weekend will be just as popular. Stephen has painted 10 incredible works for us and I’m sure there’ll be one or two surprises on the night, too, so worth coming down over the weekend if you’re in the area. 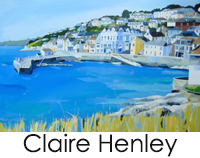 Claire Henley has her annual exhibition on Saturday 18th, too. 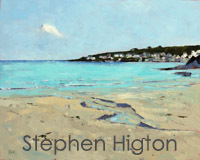 Like Stephen, she’ll be kicking off with a drinks open evening on the Saturday at 6pm followed by her being there from 11am – 4pm Sunday and Monday. 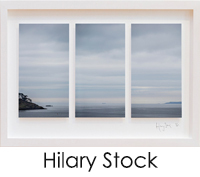 Additionally, Claire will be doing a Popup exhibition at the iconic Hotel Tresanton on Tuesday 21st, so if you can’t make the Portscatho Shelter events, you’ll be able to catch her in St Mawes then! Either way, Stephen and Claire’s exhibition collections will go live the day before the start, on their respective pages so you can have first dibs! 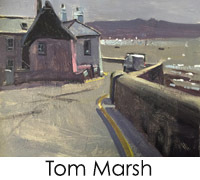 Tom Marsh came in with a moody collection he painted especially for us on his trip to St Mawes in early July. They’re all live here. 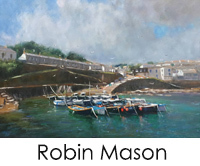 Robin Mason added new works at the beginning of July, too, and he just came down yesterday with new work thanks to his sales of those. 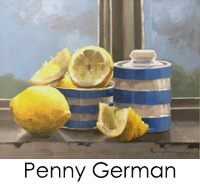 Penny German has been painting for us again after having incredible success with her last batch… I doubt we had them a week before they flew! 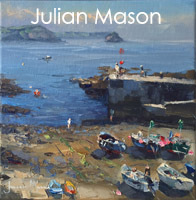 And Julian Mason‘s popularity hasn’t waned a bit. If anything he’s got even more popular. 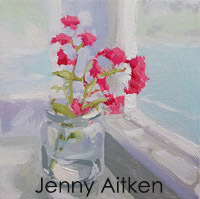 The lovely Jenny Aitken‘s Valerian paintings have been a hit since her shelter exhibition, so have a look at the last ones asap. 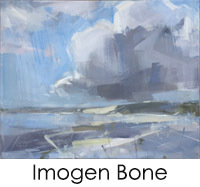 And everyone’s favourite, Imogen Bone, delivered an astonishing new collection mid month and two sold within house, so make sure you check those out before they all sell. 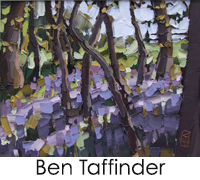 Ben Taffinder, who we have kept strapped to the easel these past few months, continues to deliver top-ups even though we can hardly keep anything of his in-house, so you should check out his page on a daily basis at present!